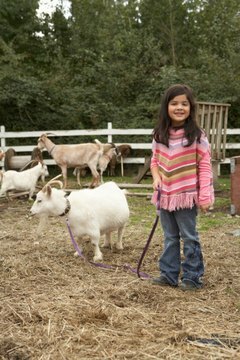 While pygmy goats are considered farm animals, it is important that they are well cared for and groomed like any other pet in the family. Bathing your goat regularly will keep it smelling clean and can also help ward off fleas, ticks and other pests with the right shampoo. Male goats often give off a stronger smell during mating season so a bath will seem imperative, but all goats deserve to be bathed and groomed regularly to enjoy a long, happy life. Attach the collar or halter to your pygmy goat and attach the leash to the metal ring on the collar or halter. Tie the end of a leash to a tree or fence post that is located in the sun. Goats should be bathed in warm weather and placed in the sun to keep from getting cold. Fill a bucket with warm water and horse or dog shampoo. Use the amount of shampoo that is advised on the bottle, or just enough to make the water sudsy and fresh smelling. Pour some of the warm, soapy water along the back of the goat's neck, starting at the base of its head and pouring down the length of its back to its tail. Brush the soapy water into your goat's fur, working from the top of the goat to the underside of its belly and down its legs. Scrub the goat all over until the suds are worked fully into its fur. Dip the washcloth into the warm water and use it to wash the goat's face and ears, scrubbing carefully to avoid getting soap in its eyes. Empty the bucket of soapy water and rinse the bucket thoroughly with a hose or in you bathtub until the water is no longer soapy. Refill the bucket with warm water. Pour the warm, clean water over your goat to rinse its fur out, using your hand to work the excess water out of the fur. You may need to refill the bucket multiple times until the water running off your goat is no longer soapy and runs clean. Wipe the goat down with the towel, squeezing gently to remove excess water. Allow the goat to dry in the sun for 10 minutes before you release it to play.